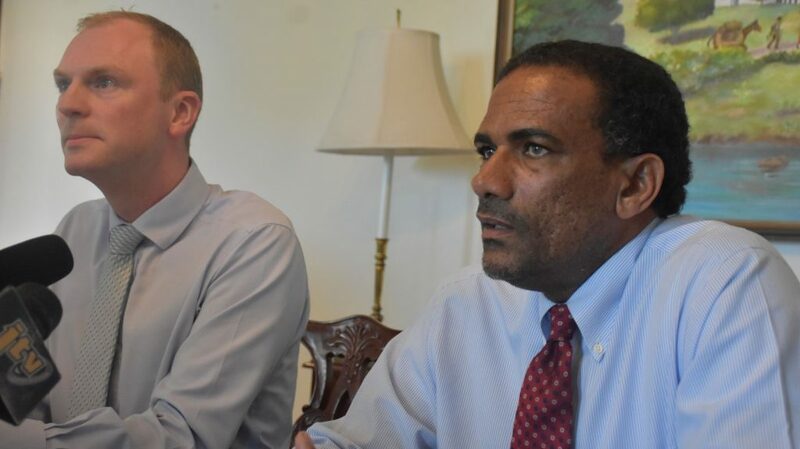 Governor Augustus Jaspert (left) and Acting Premier, Dr Kedrick Pickering at a press conference at Government House on May 16. Government has said the British Virgin Islands is not yet ready for the hurricane season which starts in two weeks. But Acting Premier Dr Kedrick Pickering has assured that the territory will become prepared in time for the typically active leg of the season. “By the peak of the hurricane season, most of the [plans] would have been put in place … The peak of the hurricane season is supposed to be between mid-August to mid-October,” the Acting Premier said. He was speaking at a media conference with Governor Augustus Jaspert on Wednesday, May 16. Dr Pickering said government continues to receive bi-monthly updates about the progress of preparations from the Department of Disaster Management (DDM). He said he is confident in the DDM’s fervour in getting the territory prepared. While giving remarks on the subject, Governor Jaspert said, at this point, hurricane preparedness is a top priority for local authorities. “We also agreed to plan extra funding from the Cabinet to repair shelters across the territory and to get communication systems in place,” the Governor said. “Things are not in the perfect condition … and that’s why recovery is such a priority to make sure we get on with that. We have the plan, we have the vision, we have the structure, we have the money,” he assured; adding that a list of emergency shelters will be released at the start of the hurricane season. He further said the United Kingdom is still interested in supporting the territory’s recovery, despite their recent decision to impose registers of beneficial ownership on the BVI and other British Overseas Territories. The move is feared to have adverse impacts on the territory’s main revenue earner — the financial services. That sector accounts for roughly 60 percent of the territory’s annual revenue. Copyright 2019 BVI News, Media Expressions Limited. All Rights Reserved. This material may not be published, broadcast, rewritten or distributed. Disclaimer: BVI News and its affiliated companies are not responsible for the content of comments posted or for anything arising out of use of the comments below or other interaction among the users. Yeah right….just like last year? we’ve known for over 8 months what happens when a big hurricane hits and how inadequately prepared we were…lessons learnt? nope… the No Direction Party has just wasted time poncing about, scrapping about whatever kick backs they can get, continually pushing for a ridiculous airport expansion scheme and neglecting to plan for tourist recovery, financial industry changes that they knew were coming and did F..k all. Just look at the state of the roads and debris everywhere, the ghuts haven’t even been cleared from over a year ago….but we’ll be ready….I can tell you now I won’t be here if there is another Irma on the way – we’ll be decimated as this government is totally inept and have failed the people they are supposed to represent…. Plan, vision, and money! Where was that last year? In VG, unlike our representative. Pickering this is delusional I must admit. with all the Government building having loose roofing, windows and no sign of securing them. Just hush!!! You all sit on your asses waiting for Government to do everything which is so shameful!! How can private residents (most aren’t citizens) be expected to fix the roads; arrange for the barging away of hurricane rubbish from Cox’s Heath so it doesn’t catch fire; repair the schools; or stop the sewerage system explding; or sort out the work permits to get the crews in to restore telecoms and Internet? Our government is an utter shambles. The Brits has abdicated their responsibility by allowing this to drag on for 8 months. It is embarrassing all round. How we can pretend to compete with either tourist destinations or financial services jurisdictions, I don’t know. The public UBO register is absolutely the least of our problems. At least, apparently, we have nice bathrooms on a cruise ship dock no cruise ships go to. Result! SMH and still no foresight, Water and Sewage diggs up the place but BVI-Electricity cannot put underground services at the same time. Od cables are still all over the place!!! “Government has said the British Virgin Islands is not yet ready for the hurricane season which starts in two weeks. But Acting Premier Dr Kedrick Pickering has assured that the territory will become prepared in time for the typically active leg of the season.” So what government doing for the past 6 months? If there were any doubt on readiness, Hurricanes Irma and Maria should have cast as any doubts aside and create a sense of urgency for full readiness. It seems as if we are gambling that no serous storm will hit and damage the territory outside of the peak period. False. Hurricane season starts on June 01 but a hurricane can form and strike the VI sooner; the territory should be in a high state of readiness at all times, especially June 01-November 30. Hurricanes pose a serious risk to life and property and resources should have been dedicated to being ready at least by June 01. Readiness is an important and urgent issue. !! !WE DO NOT HAVE AN EFFECTIVE GOVERNMENT!!! WE need to stock food and other supplies away so if another storm hits we will be sufficient and prepared. Talk and work with your neighbors and your community and create contingency plans.
! !DO NOT WAIT FOR SOMEONE ELSE TO START!! We all have seen the response time of this unprepared,slow responding, delusion shill of a government. People still are in desperate need while our government is worried about spending $700k on Festival and other follies. Keep in mind, we had solid homes and buildings and they were blown away. What will happen to us if another monster storm shows up in 2 weeks time. Insurance not paid from the last season and new one here! Making money from the new season as they always do! Beware their promises. Buyer beware. The insurance companies are already prepared to make sure they are not the ones that have to pay for what they agreed to. 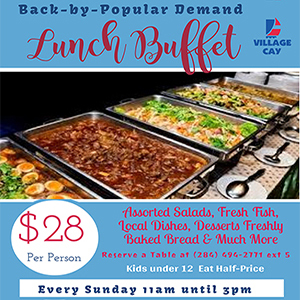 Who in the BVI going to make sure they do? Hope in Hell we ready for this year when you view the state of the place – Our Premier shouldn’t be swanning off first class for a weeks jollies to the UK when this Island needs leadership when it’s on its knees – but even when he’s here he’s been AWOL when things need to happen – lets hope we don’t offend our Governor anymore as we need him to stay and help us effectively…. Copyright © 2006 - 2019 - BVI News, Media Expressions Limited. P.O. Box 4494, Road Town, Tortola, British Virgin Islands All rights reserved. BVINews.com and the editorial content, graphics, and products of the BVINews.com website, unless otherwise noted, are the products of BVINews.com, Media Expressions Limited. The information presented on BVINews.com is copyrighted as collective work. Outside of personal use, any unauthorized reproduction, by any means, mechanical or electronic, without the express written permission of BVINews.com is strictly prohibited. Copyright © 2019 — BVI News. All Rights Reserved.